We’d brought a formidable team for this anticipated quarter final match, with Sam Milson (back in Sheffield) and Kieran significantly improving our chances against a strong Ecclesall. But bumping into Dave Adams in The Abbey carpark, he tells me they’ve been expecting to see Sam: intelligence from somewhere…. But still, great players if not quite the surprise factor we were counting on! Very interesting match to watch. 3 fairly early draws: Chris v Dave Adams on board 3, Jon v Jonathan Tait on 1, then John F v Farshad on 4. But Ian (facing John Clark) and Kieran (Ewan Cormack) are better – and Sam is equal against Jim Burnett. Lots of interest in Ian’s middle game position: he’s playing extremely well against some inaccurate opening moves. But he is in bad time trouble and in the endgame his opponent is getting some threatening-looking counterplay. But still, Kieran has played very nicely on the White side of a Kings Indian Bayonet Attack: and I think we’ll probably win, with Sam now also standing better. 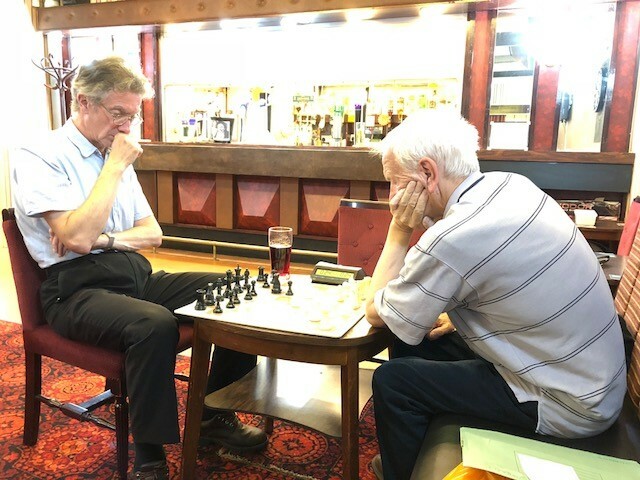 Still, it’s quite tense, as people are crowded round the three outstanding games….. But then out of the blue Ian’s opponent resigns (he’s blundered his knight – see the full game below) and Kieran wins: we’re there. 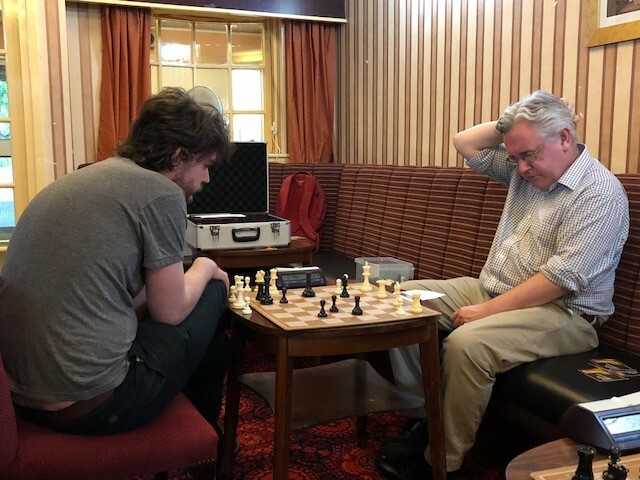 And Sam beats Jim too: 4.5-1.5 – a great result. Nomads C top the table on 20 points out of 20 following a double points win at Woodseats. Wins for Les, Arkady and Sam and a draw for Jo. Eventually the A team gets its campaign underway with a trip to Hillsborough, and what a fantastic result for us winning 5-3. Wins for Jon, Chris (by default) John & Pete and draws for Nick & Steve gave us the points to secure a well deserved victory. Thanks to everyone who played tonight, what a great way to start the season. On to next match away to Darnell next Monday 5th Nov. Here he played 26…Rfe8, allowing White to play Nf4 and then Rd1, consolidating (though I assume it’s still much better for Black) – the game ended as a draw. Can you do better than our grandmaster in this position?! There are actually two very strong continuations. Solutions in a few days! The new ECF grades have been released today. Club members with grades are listed below. Nine Nomads gathered for the first week (3 games) of the club championship. The big guns, Jon & Chris, met in round 3 with Chris coming out victorious. The British Chess Championships take part in Hull this year, 27th July – 5th August. Jon Nelson is so far the only Nomad in the entries but it’s not to late for anyone who wishes to take part. There are classes for all abilities.